Do Corporate Wellness Incentives Really Work? As a wellness management company, one of the most commonly asked questions we hear is, “do corporate wellness incentives actually work?” What role should a corporation have in the personal lifestyles of their employees? Many companies are now implementing wellness programs and corporate wellness incentives to promote healthier lifestyles both on and off the job. Some employees are reimbursed for their gym membership costs, given free health coaching, offered discounts on health insurance if they meet certain standards…and the list goes on. If your company is considering implementing wellness incentives, you may be looking for some help managing and tracking those incentives. Check out our video about the Results Now Program to find out how Wellworks can help! So now we know all about wellness program incentives and how to manage and track them. But are these incentives actually effective? When answering these questions, there are several factors to consider. Companies use corporate wellness incentives to motivate their employees to participate in their wellness programs. Incentives can be rewards, money, discounts, or even penalties (otherwise known as disincentives). The goal of these rewards or penalties is to assist employees with changing their behavior and to encourage them to live a more well-rounded and healthy lifestyle. Employers want to help their employees lose weight, stop smoking, be aware of their health, avoid mental health issues and even fight disease. We can think about incentives and disincentives with a helpful analogy. 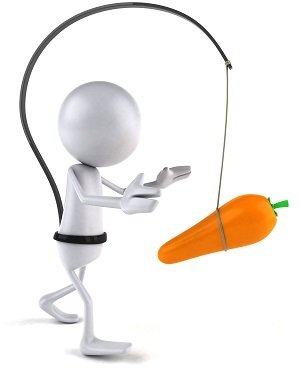 Corporations use either “carrots,” which are incentives to change or modify behavior or participation, or “sticks,” which are disincentives or penalties for not cooperating or participating. Research has shown that “sticks” may actually be more effective, since employees are often motivated more by a penalty than a reward. If a monthly fee was incurred by employees who didn’t participate in even a single aspect of a company’s wellness program, there would be more participation overall because everyone would be getting involved to avoid the penalty. However, companies want their employees’ experience with their wellness program to be positive, so they choose “carrots” over “sticks” most of the time. There a few models that corporations use to implement their wellness incentives. Each has their own rate of effectiveness. The incentive program that will work the best for your company will be based on your employees, your budget, and the implementation of your wellness program. Figure out which model works best for you and your business. Other companies have decided to offer a more buffet style incentive program. A variety of rewards are available and employees can pick and choose which ones they would like to be involved in. This model’s rewards system is based on the idea that all employees are different, so they can all decide what health activities work best for them. One may choose to take a self defense class, while another would prefer to fill out an assessment and discuss their health with a nurse. With the variety of corporate wellness incentive models available, you can choose which one is best for your company. Wellness incentives do actually work as long as they are implemented correctly. If you need assistance with your wellness program, we would be happy to make some suggestions. Click the offer below or call us today to request a free trial of our customizable online wellness portal!